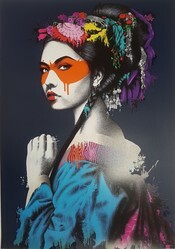 FinDAC is a self-taught, non-conformist urban artist who has defined and perfected an atypical spray paint style he has dubbed Urban Aesthetics. Hailing from Cork city (Ireland), he has paved a singular path through the global urban art scene whilst keeping his gallery output deliberately minimal: preferring instead to let the streets be his exhibition space as he crisscrosses the globe on his self-funded, self-organised paint excursions. His artistic influences stem from dark graphic novels all the way through to rebel artists such as Salvador Dali & Francis Bacon and classic illustrators such as Aubrey Beardsley. He is featured regularly in urban art publications and is constantly and consistently named in annual polls on the best of street art and artists.